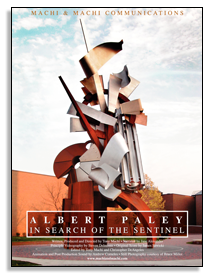 Machi & Machi Communications, Inc. is pleased to announce that it garnered a New York Emmy Award in the Arts: Program/Special category for its documentary, Albert Paley: In Search of the Sentinel April 6, 2008 at the 51st Annual NY Emmy Awards in New York City. The documentary was also nominated in the Photographer: Program category. In July 2007, In Search of the Sentinel garnered the prestigious CINE Golden Eagle Award. For more information go to www.nyemmys.org and www.cine.org. To view a Quicktime movie of the Emmy event, click here. Click the image to see an excerpt from the DVD. Flash 8 required. Click here to download the latest plug-in. 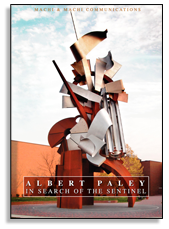 Albert Paley: In Search of the Sentinel is a one-hour documentary that follows the vision of the artist, from idea through fabrication and installation of the largest public sculpture in the United States. The story, rich in the creative process, details the fabrication and installation of the Sentinel and highlights other noted works from Paley's career. Not just instructive, the "gee whiz" quality of the documentary is also highly entertaining. Click the image to see some pictures from the book. The monumental site-specific metal assemblages Albert Paley has created over the past three decades place him not only in the forefront of contemporary sculpture but also in the vanguard among artists working in the new, genre-defying area that has been called "Archisculpture"; owing to his skill in merging boundaries between the two disciplines, and his innovative experiments with environmental and formal considerations. 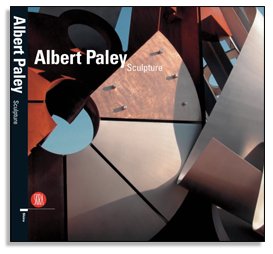 This richly illustrated monograph presents the full spectrum of Albert Paley's work. Paley goes beyond creating sculptures that stand as isolated works of art. His sculptures enhance the spaces in which they are placed and, in return, are enhanced by those spaces. He has established himself as an artist who is constantly pushing boundaries, questioning old categories and redefining himself in his own distinctive idiom, at once visionary and persuasively tangible. Noted art historian Donald Kuspit discusses Paley's development as an artist, his virtuosity as a monumental sculptor and his diverse and significant achievements. Beautiful, full-color, 18" X 24" movie poster of the Sentinel from the cover of the DVD with major production credits. Photo courtesy of Bruce Miller. All rights reserved. Click here to download an order form for the above products. ©2007 Machi & Machi Communications. All Rights Reserved.